No one likes taking out the trash, but with a nudge, even little helpers can find fun in this mundane chore. Ask for help sorting materials in the recycle bin for an educational chance to throw things without getting into trouble. Or try timing how long it takes to gather trash from the bedrooms or bathrooms, and set a goal to break that record next week. 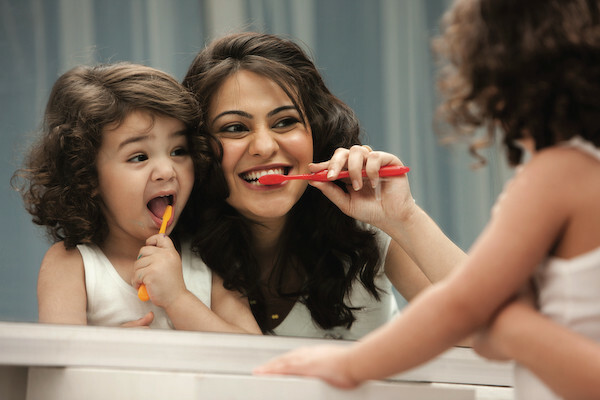 Getting kids to brush not once but twice a day can be an onerous endeavor, but making the activity silly may be just the answer. The “Silly Brushing Song” is a fun, interactive music video and tool for parents that Tom’s of Maine created in partnership with children’s singer and songwriter Laurie Berkner to help get kids brushing for a full two minutes, twice a day, as recommended by the American Dental Association. For a winning combination, add Tom’s of Maine Silly Strawberry toothpaste, the No. 1 natural children’s toothpaste according to SPINS, a provider of retail consumer insights for natural, organic and specialty products. Celebrating its 25th anniversary, the toothpaste is made for kids ages 2-6 with natural ingredients including real strawberry extract and no artificial flavors, dyes or sweeteners. Learn more at tomsofmaine.com. Tools made for pint-sized helpers can make all the difference in getting junior gardeners on board. So can setting small, attainable goals so they can celebrate a sense of accomplishment. Try designating a flower bed to get rid of leaves or a section of the yard that needs sticks removed. Be sure to demonstrate proper techniques and give frequent praise for a job well done. It’s no secret that kids can destroy a room in minutes, especially when it’s a room filled with their favorite toys. When it comes to cleaning up, all that mess can be overwhelming. Look for ways to make the chore more manageable, such as picking up all the cars and trucks first then the building blocks next, for example. Sing songs while you work to help make the time go faster. For many households, pets are not only beloved members of the family, they’re living, breathing lessons in responsibility. Once the novelty of a new animal wears off, however, so can the excitement of feeding and walking. A simple sticker chart can be a hands-on and effective way to remind kids that this is a chore that needs to be completed every single day. Plus, pet care can be a fun way to introduce children to the importance of responsibilities and becoming a “big kid.” For added fun, make your own stickers using funny photos of your family pets.